Bar Stools vs. 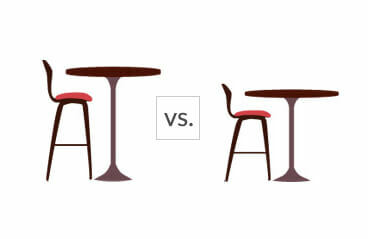 Counter Stools: Which one should I use? Generally, you’d have to determine the use for your area. We’ve provided 6 pros and cons for determining if a bar stool or a counter stool will work as your seating choice. Bar stools are great for height, such as looking out a window. Bar stools can communicate a sleeker look that you will want for your restaurant or bar. They are the perfect height for a standard bar. Not recommended for shorter people or small children because they are much harder to climb onto. Counter height is great for people who have had knee surgery, back surgery, hip surgery or for people who have trouble stooping down in a chair. Insuring the stool is stable enough (doesn’t tip and isn’t lightweight), children will have a much harder time tipping them over. Note: Children should not be standing on any stool.